Six Flags Magic Mountain discounts - Hotels Etc. Six Flags Magic Mountain is located north of Los Angeles at the Magic Mountain Parkway exit off Interstate 5 in Valencia. Known worldwide as a thrill ride haven, the 260-acre theme park features 17 world-class roller coasters and over 100 rides, games and attractions for the entire family. 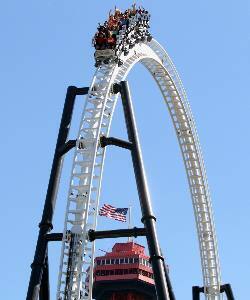 Six Flags Magic Mountain is home to 11 different world records! Among the park’s world-class roller coasters and thrill rides are TATSU, the tallest, fastest and longest flying coaster on Planet Earth; Scream, Southern California’s first floorless coaster; X, a fourth-dimensional roller coaster; Déjà Vu, a looping, boomerang coaster; Goliath, the giant among coasters; SUPERMAN: The Escape; BATMAN The Ride; THE RIDDLER’s Revenge and many more. Within Six Flags Magic Mountain is Bugs Bunny World, a six-acre, interactive wonderland featuring numerous rides and attractions that will provide a real thrill for kids and adults alike. Designed for the pint-sized guests, Bugs Bunny World is the home of legendary Looney Tunes characters such as Daffy Duck, Yosemite Sam, Sylvester, Foghorn Leghorn and America’s favorite rabbit, Bugs Bunny. Attractions include Daffy’s Adventure Tours, Merrie Melodies Carousel, Pepe Le Pew Tea Party and many others including Goliath Jr. – the giant among kids’ coasters. Goliath Jr. is a miniature version of one of the hottest rides in America where children can enjoy gentle hills and pint-sized thrills.